Nearly seven decades after it opened its doors selling pure Irish linens, The Linen Shop is celebrating its re-launch, bringing back to Bay Street the first book store in the downtown area in more than five years. 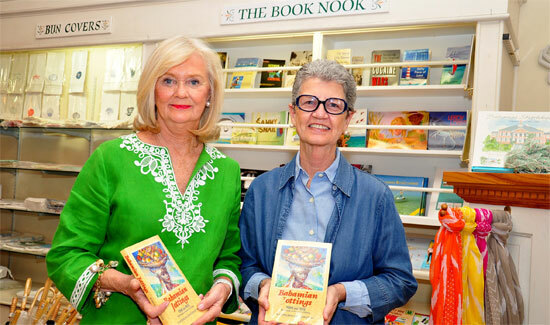 Inspiration for The Book Nook inside the shop that has become a staple in historic Nassau with its heavy wooden trim painted a deep forest green came from one of the owners finding a copy of a book of poetry and prose by the shop’s original owner, her late grandmother, Wilhelmina Johnstone. Bahamian Jottings had been out of print for some time, said Heather White, who with her sister-in-law Gloria Raine, has held on to the traditions of high quality goods in a street increasingly given over to t-shirts and souvenirs. White and Raine said it was like a light bulb. The women agreed instantly on one thing – The Book Nook, as they dubbed it, would handle books about The Bahamas, whether by Bahamians or others. “There were more titles out there than we ever dreamed,” said Mrs. Raine. Among the best-sellers: Bahama Mama’s Cooking, Jewish Pirates of the Caribbean, Bahamas Sketchbook, A Serpent in Eden and The Story of The Bahamas.” More than 30 titles now take their place astride linen bun covers, bamboo sheets, fine scarves, dozens of styles of place mats and tablecloths, gifts for occasions from birthdays to anniversaries and a permanent display of Bahamian holiday ornaments. On Sunday, April 13, The Linen Shop will officially celebrate its re-launch with a function at the shop in the afternoon. And, yes, Wilhelmina Johnstone’s Bahamian Jottings will be there for the event. 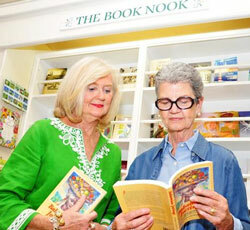 The book that inspired the re-birth of one of Nassau’s oldest retail traditions has been re-printed.